A free to play strategy MMO where players take command over units in a squad of mercenaries and fight it out with other players in tactical turn based battles, using detailed maps that provide cover and line of sight mechanics, players will have to use brains to out-think their enemy as they battle to capture flags and acquire valuable resources. The basic concept of the game is a turn based capture the flag/point capture game, players take it in turns moving their units around the map, alongside teammates’ units, and trying to take control of 5 neutral flags on the map. Each turn players can move their unit a set distance, depending on the mercenary type, take cover behind terrain objects, fire weapons at visible enemies or use a variety of other class and gear based abilities. Players need to work cooperatively as a team to try and overcome the enemy, each flag in possession by the team will earn points each turn, the more flags controlled the more points are acquired. However, flags are controlled by the last unit to move over them, so the constant back and forth of capture and defend makes a strategic game; the winner is the team that reaches 5000 points or who manages to kill off all the enemy units. A land that hasn’t been located on any known map, possibly a remote corner of Earth itself, a parallel world or perhaps even another planet; no one knows, but the only way to reach it is through the portal. Built in the 1940s this portal was created from the works of Nikola Tesla, his theories and inventions testing teleportation lead to the creation of the portal and the new world it discovered, known as the Tesla Zone. Scientists, military and settlers travelled to this new location, discovering a powerful blue crystal that had incredible energy properties and came to be known as Telarium. The “gold rush” happened and thousands travelled to this place to find their fortune, but over the years the prospects of a happy future turned to a bitter and deadly war, greedy corporations, deadly mercenaries, prisoners forced to recover the resource, mutated humanoids from the original settlers and even deadly wild inhabitants now plagues this deadly land fighting everyone and everything. There are 4 different class of mercenary that are divided up into 12 specializations, these individual mercs have access to unique gear, skills and combat tactics that make them a unique addition to any squad and opens up various playstyles. Players must individually equip their characters with new weapons that they have unlocked as they build up their Military rank and research new items, these can be bought and equipped with the currency earned through playing games. With a variety of weapons available from pistol sidearms, automatic rifles, sniper rifles, grenades and more, players will fill particular roles when in battles; for an added edge there are numerous Premium weapons that can be bought with earned premium currency or purchased with real cash. One of the most interesting mechanics that truly makes Affected Zone Tactics a strategic MMO is the line of sight mechanics; players can only see on the map what one of their allied units has direct line of sight on. 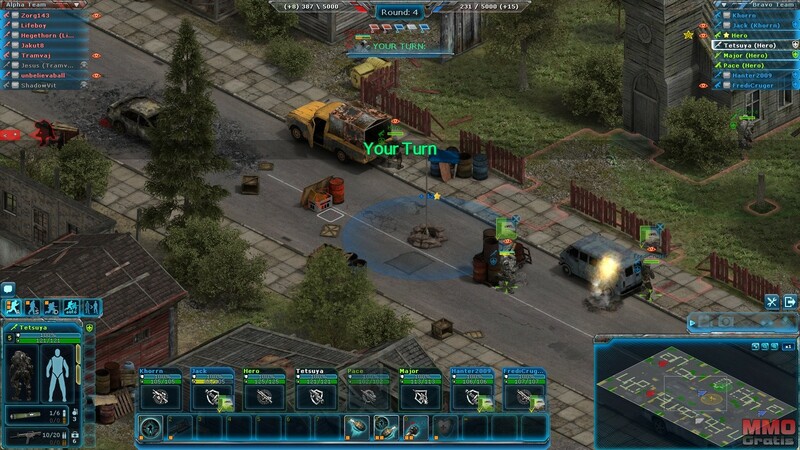 Players are able to use stealth and cover the move around the map each turn, dashing from building to building, or hiding behind terrain features and staying out of sight as they try to set up an ambush on enemy units. Of course the enemy will be doing the same thing, so a huge part of the game comes down to trying to determine what strategy the enemy may employ, where they move to and the position of their troops. Throwing grenades into open squares to flush out a suspected hiding enemy is a perfect tactic to out-play your opponents. Looking for more Free MMO turn-based,Free MMORTS,Free MMOs games?